Feel at home in Canberra, the Nation's Capital!!!! 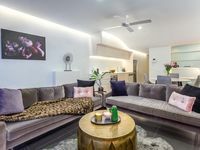 Property 24: Feel at home in Canberra, the Nation's Capital!!!! Spacious 6BR house, central location, near Dickson shops and City Centre. Property 27: Spacious 6BR house, central location, near Dickson shops and City Centre. Property 39: City Life Apartment. Nishi building. Views. Close to everything. Free NBN and parking. Property 40: Nishi building. Views. Close to everything. Free NBN and parking. Beautiful, cosy and the closest 3BR Townhouse to the city! Property 49: Beautiful, cosy and the closest 3BR Townhouse to the city! Stay in the Center of Camberra! Walk to many attractions, shopping and restaurants. Canberra with a law protecting the public from HOT water. You will only get a warm bath and I wasn able to switch to the shower, knob looked missing. We did use the electric radiator which provided more heat than the AC system, I would recommend the auto setting. Having secure safe parking was a plus since all parking seemed paid. The laundry and the kitchen was fully equipped and easy to use. Another plus was the downstairs toilet. Well equipped, clean, thoughtful instructions, good location, would stay there again.